Dan McFarland got off to a winning start despite a nail-biting finish against Scarlets. Ulster players celebrate at full-time at Kingspan Stadium. 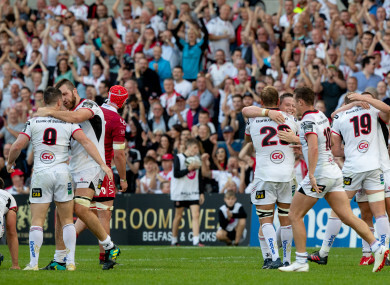 ULSTER BEGAN THEIR Guinness PRO14 campaign, and life under Dan McFarland, with a nail-biting 15-13 win over Scarlets at Kingspan Stadium thanks to a last-minute John Cooney penalty. The Ireland scrum-half, recalled to the side along with Iain Henderson, was ice-cool as he secured the victory after kicking five penalties in the game, Ulster’s only points of the match. It was also significant for the hosts as they saw star back row Marcell Coetzee make it through 55 minutes unscathed, while debutants Will Addison and Billy Burns also impressed in their first competitive appearances in Belfast. Things nearly got off to a disastrous start for the Ulstermen as they were carved open in the early moments of the game by a brilliant low pass from Steff Hughes, a late replacement for Jonathan Davies prior to kick-off, only for Ulster to scramble and save the try. But it didn’t take long for the visitors to strike and, after a driving maul did the leg work, it was a great switch of direction from Rhys Patchell that allowed him to outpace Cooney to the line and dive over for the opening score, which he himself converted. But falling behind only seemed to spur Ulster into action and they very nearly had a response when Addison kicked in behind for Darren Cave to gather, only for the Scarlets to recover well and stop the centre from going the rest of the way. Instead they would settle for a penalty from a scrum to open their account, Cooney slotting it over from under the shadow of the posts, before some beautiful interlinking offloading play yielded another penalty when the Scarlets cynically slowed down the ball and Cooney made it two on the quarter-hour. And they took the lead for the first time when Cooney put over another penalty when the Scarlets were caught offside, and it looked like the tide had turned strongly in their favour, however they were unable to capitalise on their momentum. Indeed, the visitors began to pile on the pressure, and but for a creaky lineout they could have had the lead at the interval, captain Ken Owens seeing a couple of throws go wayward as the Scarlets failed to take advantage of some good field position. But after the break it was they who came out a renewed team, and they thought they had a try when Patchell ghosted through a hole in the home defence and popped the ball inside to Ken Owens, only for the TMO to rule that Nick Timoney had done a fantastic job to hold him up on the line and force a knock-on. That would be one of Patchell’s last acts, the Wales fly-half replaced by Dan Jones after shipping a knock, and Jones put the Scarlets back ahead in the 54th minute with a penalty, only for Cooney to edge Ulster back ahead four minutes later with one of his own. But it took just three minutes for the Scarlets to retake the lead when Jones put over another penalty after Tom Prydie won their own restart. However, Ulster were handed a brilliant chance to go on and close out the game when the TMO intervened to determine that replacement flanker Ed Kennedy had shoulder charged Henry Speight – a yellow for the Scarlets replacement, and Ulster in a great position. That position never materialised. After missing touch from the kick, the Scarlets masterfully played out the 10 minute disadvantage, although they had to survive a scare when Cooney put a penalty wide to win the game. But the drama didn’t end there. With Kennedy waiting to come back on, Ross Kane made a break for Ulster and, when he looked inside, the supporting Cooney was hauled back by David Bulbring off the ball. A clear yellow card, and a penalty right in front of the posts. Cooney, the aggrieved party, held his nerve, and Ulster’s young guns have their first win under Dan McFarland. ULSTER: Will Addison (Angus Kernohan 55), Craig Gilroy, Darren Cave, Stuart McCloskey, Henry Speight, Billy Burns, John Cooney; Andrew Warwick (Eric O’Sullivan 55), John Andrew (Adam McBurney 55), Tom O’Toole (Ross Kane 20), Alan O’Connor, Iain Henderson (Kieran Treadwell 65), Marcell Coetzee (Chris Henry 55), Sean Reidy, Nick Timoney. Subs not used: David Shanahan, Angus Curtis. SCARLETS: Clayton Blommetjies, Tom Prydie, Jonathan Davies, Kieron Fonotia, Steff Evans (Ioan Nicholas 59), Rhys Patchell (Dan Jones 49 (Phil Price 77)), Sam Hidalgo-Clyne (Gareth Davies 62); Rob Evans, Ken Owens (Ryan Elias 59), Werner Kruger (Simon Gardiner 73), David Bulbring, Steve Cummins, Blade Thomson, James Davies, Josh Macleod (Ed Kennedy 66). Sub not used: Dan Davis. Email “McFarland era starts with a bang as dramatic Cooney penalty seals last-minute win for Ulster”. Feedback on “McFarland era starts with a bang as dramatic Cooney penalty seals last-minute win for Ulster”.